Rest.Stay off the injured foot and ankle, since walking can cause pain or further damage. Ice.Apply a bag of ice covered with a thin towel to reduce swelling and pain. Do not put ice directly against the skin. Compression.Wrap the foot and ankle in an elastic bandage to prevent further swelling. 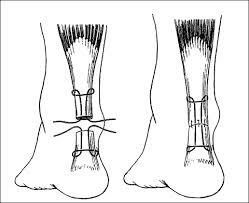 Elevation.Keep the leg elevated to reduce the swelling. It should be even with or slightly above heart level. â€¨In diagnosing an Achilles tendon rupture, the foot and ankle surgeon will ask questions about how and when the injury occurred and whether the patient has previously injured the tendon or experienced similar symptoms. The surgeon will examine the foot and ankle, feeling for a defect in the tendon that suggests a tear. 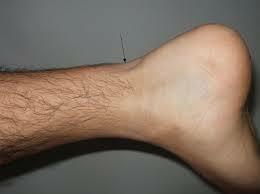 Range of motion and muscle strength will be evaluated and compared to the uninjured foot and ankle. If the Achilles tendon is ruptured, the patient will have less strength in pushing down (as on a gas pedal) and will have difficulty rising on the toes. For Achilles' Tendon Injuries, contact one of the Foot and Ankle Specialists at Academy Foot & Ankle for evaluation.